This is the long awaited first children's novel from the much loved writer and illustrator Shirley Hughes. There is a very personal feel to this story set in Italy during 1944, featuring Paolo and his sister Constanza. Their father is away, perhaps fighting for the resistance and their mother is English, which means that they are under pressure from the German authorities. 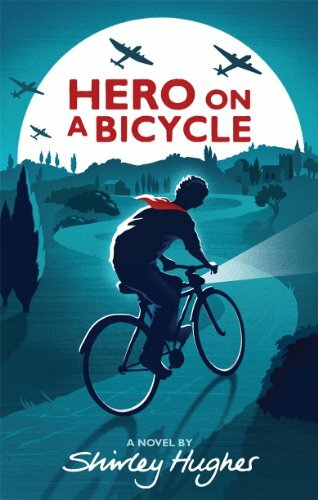 Paolo wants to help the resistance but does not know how; then his beloved bike is used by a partisan to escape from the Germans and an opportunity arises. There is an old fashioned feel to this book which is in keeping with the period. The background is believable and the story well paced with lots of action although it is told in the third person, so that we are observers rather than directly involved. It also reflects the tensions of a society which is falling apart and where those who collaborated are beginning to contemplate what the future might bring. It is very much a book about families and about the loyalties which keep them together but which can also cause people to betray friends and neighbours.